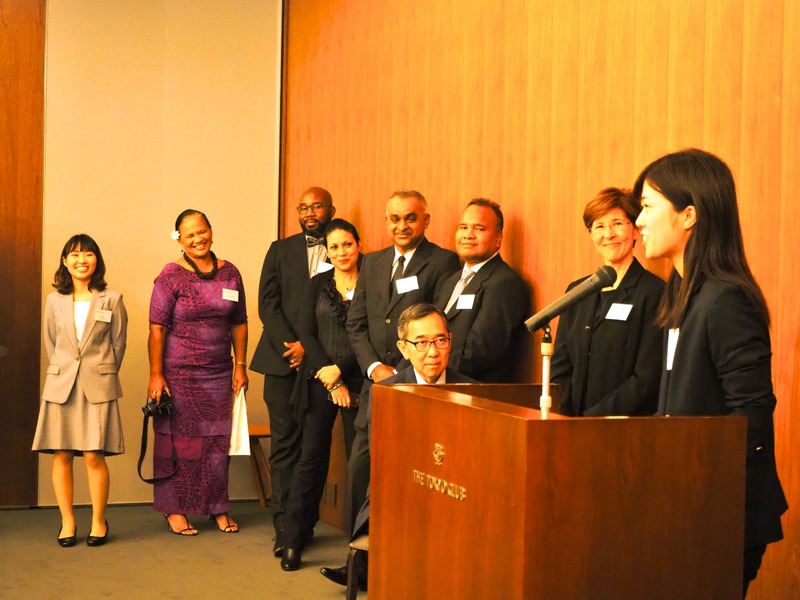 Every year since 2015, the Association for Promotion of International cooperation in association with the Foreign Press Center Japan hosts senior journalists from the Pacific and Caribbean in Japan. 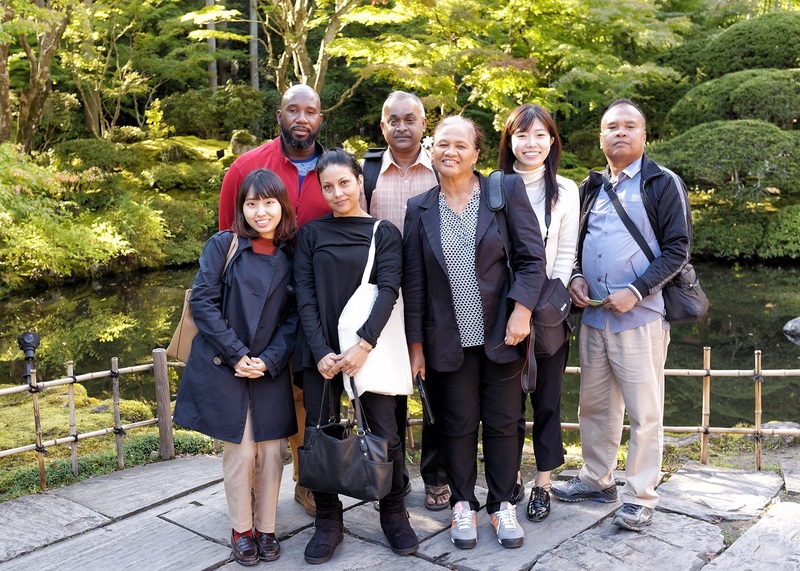 As members of the Pacific-Caribbean Journalists Program, they spend nearly two weeks learning about Japan’s experiences with preparing for disaster preparedness, environmental policies and programs, and Japanese culture. This year’s cohort conducted interviews and site visits in Tokyo, Kumejima in Okinawa Prefecture, and Matsushima, Higashimatsushima and Sendai, areas directly impacted by the devastating earthquake and tsunami of March 2011. These profiles of this year’s Pacific-Caribbean journalists were written by two students from Japanese universities who were also full participants in the program. They will be joining news organizations in Japan as reporters when they graduate in March 2019. 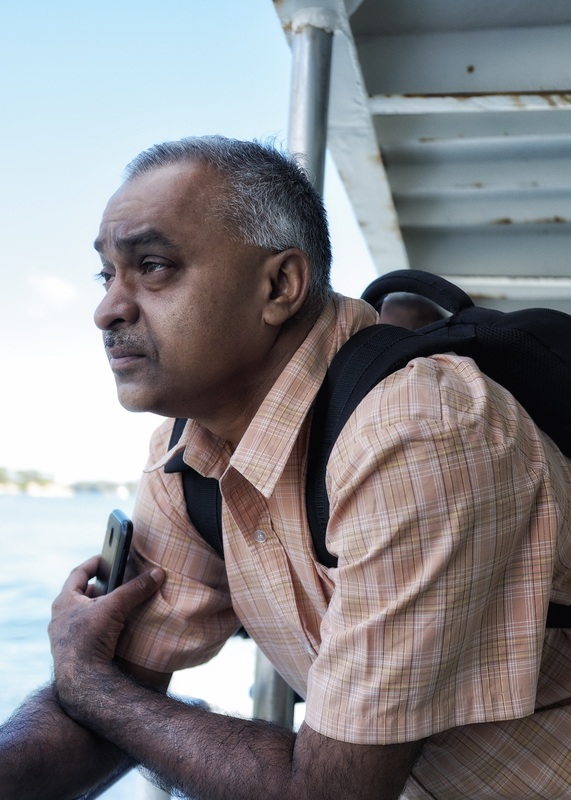 TOKYO -- “Stay ethical, report correctly and say you’re sorry if you have made a mistake.” That’s what guides Anish Chand, a veteran journalist and freelance contributor from Fiji. 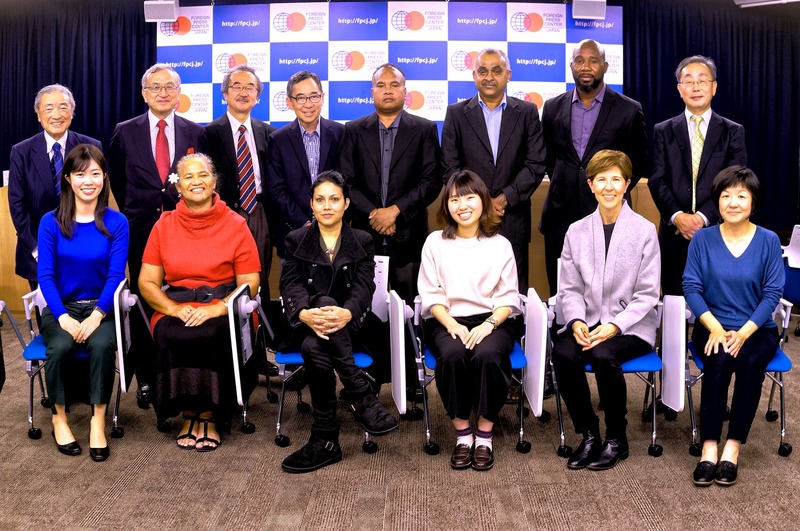 He was in Japan recently as a participant in the 2018 APIC-FPCJ Pacific-Caribbean Journalists Program. Chand has worked in television, radio and print, and is one of Fiji’s most experienced journalists. But like others in journalism in that South Pacific country, Chand faces a difficult challenge. It is the Media Industry Development Decree implemented by Fiji’s government in 2010. The Media Industry Development Decree makes it a crime if a journalist attacks the judiciary or writes articles that spread racial antagonism. The law effectively prohibits serious investigative journalism in Fiji, Chand says, if it is indiscriminately applied by government authorities. Chand is concerned that the news media now seldom conducts investigative reporting because it finds that news sources are reluctant to talk to journalists. They fear arrest for appearing to be critical of the government. Each and every story has to have “balance.” But no one in government will respond to reporter inquiries either for fear of the law, or to try to kill a story by preventing a journalist from obtaining all views. 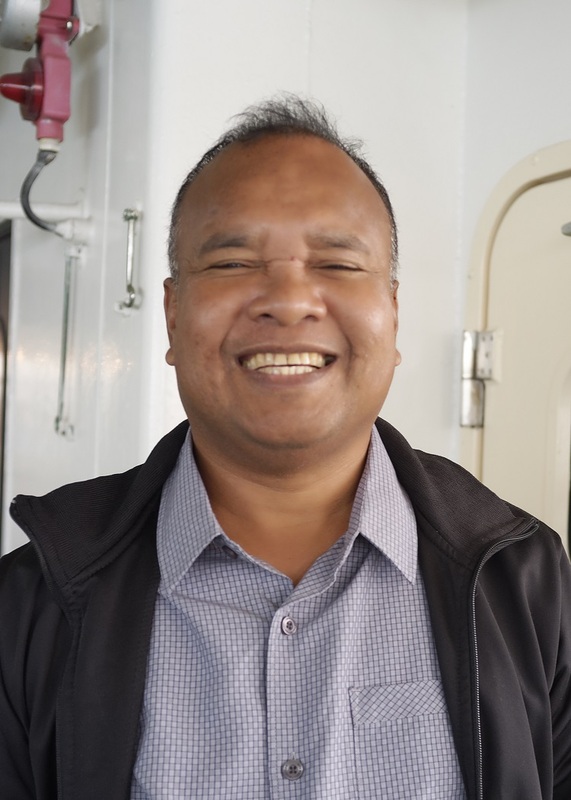 Chand says “journalists in Fiji are afraid to venture into this unwritten world of Fiji journalism.” It’s a frustrating – and potentially dangerous – environment for Chand and other Fiji journalists. “If you follow all the ethical rules of journalism, you won't only become a good journalist, but a great journalist,” he says. However, he left sports journalism due to what he felt were limits on his potential for professional growth. Chand explains, “You can only rise up to editor, but if you want to go further, you have to get into news.” With many experiences in news reporting, Chand decided to embark on a new adventure. Chand left Fiji TV in 2015, and moved to his hometown, Rakiraki, three hours away from Suva, the capital city. “I have done all the types of reporting for 24 years, and I am not interested in working for the ‘company’ anymore. Freelance journalism keeps my mind fresh,” Chand says. 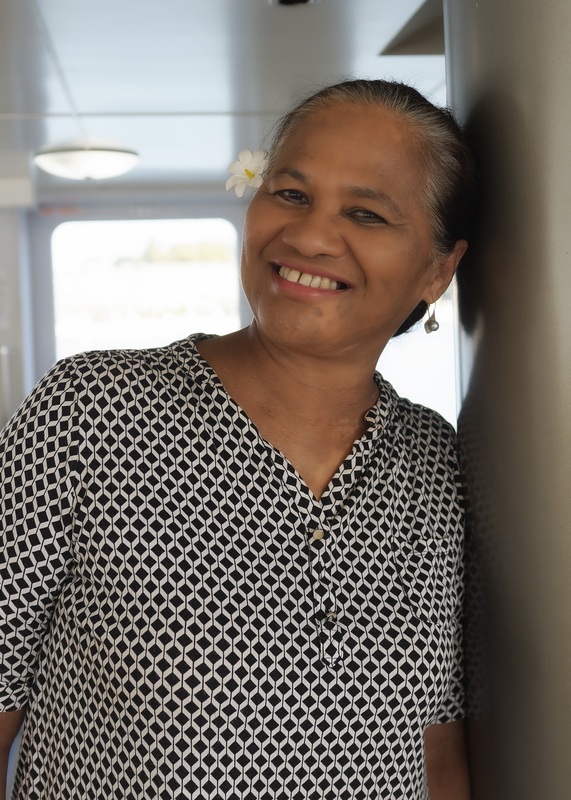 Miller, a participant in the 2018 APIC-FPCJ Pacific-Caribbean Journalists Program, is the news director of South Seas Broadcasting, as well as the mother of six children and 17 grandchildren. She’s responsible for three daily radio news bulletins, plus reporting for the company’s online news service Talanei.com. Now 59, Miller was born and raised in neighboring Samoa, then Western Samoa. Miller’s journalism career started at age 16, when she left in her second to last year of high school to have a baby. She enrolled in a two-year broadcasting course offered by the United Nations and the Samoan government, having been chosen for one of only 13 spots. Over more than 30 years in journalism, in a career that’s taken her to newspaper, television and radio newsrooms, Miller has developed a reputation as one of the best-known journalists in the South Pacific. She’s also known as a hard worker. “Every day, I go to work at 4:30 in the morning, and come home at 7:00 at night,” she says. “This job has long hours. It was very tough” raising her large family, she says. Miller says thanks to Samoan culture, in which neighbors cooperate with each other to raise children, and her late husband, a well-known musician who spent time with the kids during the day and worked at night, she was able to successfully raise all six of her children and nurture her journalism career. Now, Miller is facing a new challenge — finding young people who are interested in journalism. She is the only person at her newsroom who records the news and takes photos. “In the newsroom, it is only me and the (Samoan language) translator,” she says. Miller adds that in American Samoa, the government seems to attract the most workers due to job security, and she notes that in such a small community, some young people may not want to report about their friends or relatives. None of her children became journalists, and sometimes she felt that her husband was much closer to their kids. However, as a mother, she makes an effort to be considerate when it comes to stories about topics like death. “I am trying to think of the people who are affected. I approach it with a personal touch,” she says. Miller has a keen interest in the human aspects of natural disasters. And she says being in Japan offers her a different perspective. “The honesty of people” in Japan, she says, “is another culture we can learn from.” Every time a cyclone occurs, her radio station is the main source of information for the public. During natural disasters, Miller sometimes stays at the station for two days without going home. She feels a lot of responsibility to provide people with information that could save their lives. She is proud of her work and loves her job, knowing that listeners are waiting to hear her voice. TOKYO -- Ongerung Kambes Kesolei is a rarity in Palau. He has the distinction of being the only journalist in the Western Pacific nation of 18,000 people who is of indigenous Palauan ancestry. And he’s one of only two newspaper reporters based in Palau. But as unusual as he may be, becoming a journalist was second nature to the reporter and editor of Tia Belau, the country’s longest-published newspaper. “It was natural for me to be a journalist. I’ve really loved reading and writing since I was small. I was writing poems before working at the newspaper,” said Kesolei. Japanese will be surprised at the small number of journalists, as Japan has about 18,000 journalists. However, the scale is quite different, as Japan has 6,000 times the population of Palau. Kesolei wasn’t formally trained to be a journalist. What he did do was eagerly study journalism by reading other people’s reporting. In addition to the Tia Belau, Kesolei co-founded the online news outlet Pacific Note. Also, he has his own radio and TV program. He is expanding the range of activities in journalism. But in doing so, Kesolei has discovered that it is easy to become the target of criticism. When politics is involved, things are more complicated. Kesolei is the brother of a politician but his brother never tells him anything. Kesolei says some people are also afraid to make public comments about politics, so some debates are anonymous. Kesolei says sometimes his family has difficulties with the work he does, but they remain respectful toward him. “The important thing for journalists is integrity, so people can trust the newspaper,” said Kesolei. TOKYO – A passionate belief in standing up for the little guy drew Kim Boodram into journalism. Now after two decades as a reporter in the Caribbean country of Trinidad and Tobago, Boodram is still ready to step into the fray. The senior reporter with the Trinidad Express newspaper is in Tokyo participating in the Pacific-Caribbean Journalists Program. She’s one of five professional journalists in the 2018 class. Also in this year’s cohort are two Japanese university students based in Tokyo, one from Tsuda University, the other from Sophia University. This year’s Pacific-Caribbean Journalists Program is examining the environment and disaster preparedness. Boodram believes the “environment” is also a matter of social justice. The environment, Boodram says, can’t speak up for itself. Boodram has reported on a number of environmental issues over the years, such as illegal coaling. However, she’s the first to admit that the victories have been few and change is a slow process. As a reporter based in Trinidad, Boodram says there are countless challenges on the social justice front. A boom in natural resources has brought great wealth to some in Trinidad, but it has also exacerbated the gap between the rich and poor, along with a shrinking middle class. With so many social and economic challenges, Boodram is the first to acknowledge that its difficult at times to keep battling the odds. “It’s hard to change the situation. I started to wonder if my work is meaningful or not. I’m just reporting what politician said that is controversial,” said Kim. “It's hard to speak the truth to people who don't want to hear it.” In such a situation, Boodram thinks that media can contribute to the people who need help. “If there is no media, no one would know about the people who are suffering from injustice. I must tell their stories for the people who cannot speak for themselves." “I remember one family who live in extremely poverty. Their child got sick and died around age of 9 because of the poverty,” said Boodram. So she wrote about the story of that family. The family even couldn’t know why child died and also they couldn’t get medical care. A few days after she published the story, a rich business executive donated beds, mattresses, a stove, and other things to that family. He gave financial support and medical care to them. “The mother cried and cried because she just couldn’t believe that they were getting those stuffs. I always remember that. I feel good about that.” said Boodram. TOKYO -- “I don’t think I chose journalism. Journalism chose me,” says Kenton X. Chance, a journalist from St Vincent and the Grenadines. 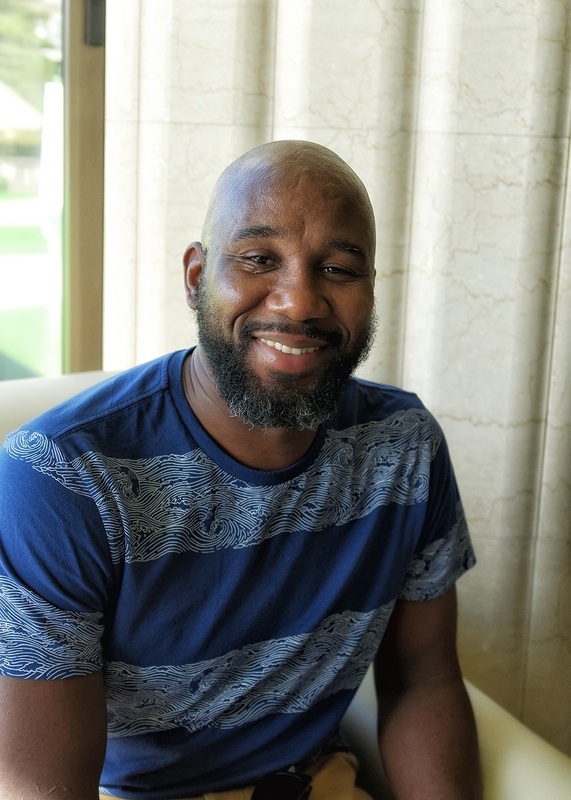 A participant in the 2018 APIC-FPCJ Pacific-Caribbean Journalists Program, he’s the founder and executive editor of the online iWitness News, which receives more than 100,000 monthly views. Chance is also motivated by his belief that informing the public is an honorable profession. “Democracy is about choices. If you do not have information, you cannot make informed decisions,” he says. Chance has been working as a journalist for 15 years. His interest was sparked when he was a student at the local community college and joined a journalism program offered by the newspaper Searchlight for a few weeks. After completing that program, his classmates selected him to be editor of The Young Vincentian, a monthly youth magazine published by The Vincentian newspaper. He started working at The Vincentian as a fulltime reporter in 2003, after graduating from the community college. In 2006, he received a scholarship to read for a degree in Taiwan and elected to study journalism and mass communication at Ming Chuan University, the first U.S.-accredited University in Asia. While in school, Chance continued to work as a journalist, in various forms. For instance, as a part of his studies in Taiwan, he developed the iWitness News website and ran it for a few years as a hobby. When he went back to St. Vincent in 2012, he left his newspaper job after six months but continued iWitness news. The unpredictable nature of journalism keeps Chance going. “What interests me is when you get up, you never know what is going to happen and what you are going to write about, rather than going to an office every day,” he says. The journalists followed a daily interview schedule, and wrote one article per day regarding a topic of interest. After the day’s main events, an editorial meeting was held where the journalists reviewed information about their visits and talked about what to write. Afterward, they had to write an article within the allotted time and send it to their coordinator. The articles were released by each journalist’s home media outlet. APIC student interns were present for the ten-day program, participating in interviews and editorial meetings, and writing up profiles of the journalists, titled ‘Profile of a Person’. On the first day of the program, the group visited the FPCJ and had an informal talk with APIC President Mr. Peter Sato, Director Mr. Megumi Araki, and FPCJ President Mr. Kiyotaka Akasaka. APIC President Sato remarked to the reporters that ‘Japan is an island nation made up of more than 6,000 islands. I believe we can share our experiences as island nations”. Following the visit to the FPCJ, the journalists visited the Ministry of Foreign Affairs and JICA (Japan International Cooperation Agency) where they listened to talks about and fervently discussed cooperation with Japan in the disaster prevention and environmental fields. At the Meteorological Agency, they deepened their understanding of nature management and disaster notification systems. The second day focused on gathering information on Japan’s advanced waste handling; the group visited a condominium in Kawasaki city and viewed first-hand how residents separate their garbage for collection. The next stop was a visit to a resource-producing waste management facility; they also observed how paper is recycled and turned into toilet paper at Corelex paper recycling plant in Kawasaki. The journalists showed an interest in the recycling plant, and actively asked questions. The last stop of the day was to the Tokyo Fire Department, where they used an earthquake simulator to experience a level 7 earthquake on the seismic intensity scale. In the morning of the third day, the journalists visited the Metropolitan Area Outer Underground Discharge Channel, a flood-prevention facility outside of Tokyo. This underground facility is a civil engineering feat, comparable to the Parthenon with massive columns and high ceilings. Afterward, the group visited the Tokyo Skytree, which uses the latest in base-isolation techniques for limiting the effect of large earthquakes, and were allowed a special visit to the supporting columns of the tower. In the evening APIC held a dinner for the visiting journalists, and each reporter gave a speech mentioning their time gathering information in Japan. Regional visits in Japan included Kume Island in Okinawa, and Sendai and Matsushima cities in Miyagi. In Kume Island, the journalists visited Okinawa Prefecture Deep Sea Research Institute and a prawn breeding farm, a cosmetics company that uses deep sea water, and a solar power farm, learning about the island’s environmental circulation program. The journalists experienced the warmth of the islanders during an Okinawa shamisen recital at dinner that evening with the island’s city hall employees. In Sendai, Miyagi Prefecture, the group visited Arahama Elementary School, which was damaged by the March 2011 tsunami but is still standing. They interviewed the disaster prevention leader, and later observed the tsunami evacuation tower and reviewed the events of the March 11th earthquake and subsequent tsunami at the Seaside Park Adventure Field that doubles as an evacuation area in case of a tsunami. In Higashi Matsushima City, the group visited Nobiru station, which was destroyed by the tsunami and now rebuilt. At the Kahoku Shinsha news agency, Mr. Shin’ichi Takeda, head of the Disaster Prevention & Education office gave a lecture, and the group held a discussion on the subject of disaster prevention. The Disaster Prevention & Education office was set up after March 11th, 2011 and the news agency started a project to make a newspaper page together with residents to spread the cautionary tales of the earthquake and tsunami by word-of-mouth, and to encourage disaster prevention. The reporters appeared to be quite shocked at this, exclaiming “surely the objectivity of disaster reporting and equality be lost if the readers become too close [to the reporting]. It is better to not develop a personal relationship.” In response to this, Mr. Takeda claimed that “we cannot stay neutral when it comes to protecting people’s lives. We cannot call it journalism when we do not save those who are in need and are exposed to danger right in front of us.” Journalist Anish Chand wrote about this in his daily article titled “Media Responsibility”, commenting “what I have learned from Japanese journalism is that journalists can also save people”. On the final day, the participants experienced the Japanese tea ceremony and trying on the traditional kimono dress at the Nihombashi Koomon cultural center. They took photos of themselves in kimono, and although it was a brief moment, enjoyed their time experiencing Japanese culture to end their trip in Japan. EVENTS "Summer 2018 APIC Student Internship"
EVENTS "352nd Lecture Meeting Regarding Global Issues"
EVENTS "The 2018 Pacific and Caribbean Journalists Program"
EVENTS "The 351st Lecture Meeting Regarding Global Issues"
EVENTS "First Xavier Exchange Student’s Graduation Celebration Dinner"
EVENTS "Sophia University’s “Micronesia Exposure Tour 2018”"
PROJECTS "News from Haiti Vol. 8: Haiti’s Cultural Features (part 3)"
EVENTS "The 350th Lecture Meeting Regarding Global Issues"
EVENTS "Pacific Leaders Invitation Program: Federated States of Micronesia Chuuk State Young Leader Invitation Program 1"
EVENTS "PM Gonsalves of St. Vincent & the Grenadines Visit to Japan"
PROJECTS "News from Haiti Vol. 7: Haiti’s Socio-economic Condition (part 2)"
EVENTS "The 3rd Japan Experience Project 'SAWARA Experience'"
PROJECTS "News from Haiti Vol. 6: Haiti’s Socio-economic Condition (part 1)"
EVENTS "The Voice of the Ambassador to Micronesia"
EVENTS "The 349th Lecture Meeting Regarding Global Issues"
PROJECTS "News from Haiti Vol. 5: Haiti’s Cultural Features (part 2)"
PROJECTS "5th APIC Short-term Internship"
EVENTS "Pacific Leaders Invitation Program: Senator Urusemal, former President of FSM"
EVENTS "Pacific Islands and Caribbean Student Invitation Program 2018"
EVENTS "Xavier Exchange Students Participate in ‘All Sophian Christmas 2017’"
EVENTS "JICA Global Plaza Micronesia Photo Exhibit ‘Pacific Light’"
EVENTS "The 348th Lecture Meeting Regarding Global Issues"
PROJECTS "News from Haiti Vol. 4: Haiti’s Current Political Situation"
EVENTS "The 347th Lecture Meeting Regarding Global Issues"
EVENTS "Japan Achieved Successes In Micronesia Unlike Any Nation Before or Since, Says Noted Historian Francis X. Hezel, SJ"
PROJECTS "News from Haiti Vol. 3: Haiti’s Cultural Aspects part 1"
EVENTS "Pacific Islands Leader Invitation Program: Samoan Minister of Information and Communication Technology"
EVENTS "University of the West Indies St. Augustine Campus: Principal Invitation Program"
EVENTS "The 346th Lecture Meeting Regarding Global Issues"
EVENTS "Assistance to Commemorate 25th Founding Anniversary of COM-FSM"
EVENTS "APIC President Peter Sato’s Visit to Micronesia"
EVENTS "APIC Pacific Islands Leaders Invitation Program: Mr. Yogesh Karan"
EVENTS "APIC-Reitaku University Student Exchange Project: Short-term Micronesia Study Abroad Program"
EVENTS "COM-FSM Student Invitation Program: Students to Study Abroad at Reitaku University & Sophia Junior College"
EVENTS "Pacific and Caribbean Journalist Invitation Program 2017"
EVENTS "Xavier Exchange Students Participate in Sawara Festival"
EVENTS "Xavier Exchange Students Participate in Oktoberfest"
EVENTS "Sophia University “Micronesia Exposure Tour”"
PROJECTS "News from Haiti Vol. 2: About the Republic of Haiti"
EVENTS "The 345th Lecture Meeting Regarding Global Issues"
PROJECTS "News from Haiti Vol. 1: About the Republic of Haiti"
EVENTS "The 344th Lecture Meeting Regarding Global Issues"
EVENTS "10th International Co-operation Discussion Gathering"
EVENTS "The 343rd Lecture Meeting Regarding Global Issues"
All Rights Reserved. Copyright © 2008-2019, The Association for Promotion of International Cooperation.